Two years on, Bouffe has adapted to life at an angle by developing clever tactics and skills to do everything he wants to do. We’d say he is one happy chappie these days, living a very comfortable life as a free-range houserabbit and receiving no end of adoration and admiration from all who meet him. So, what have we learned about headtilt? When our adored Bink acquired a headtilt while he was a very healthy and happy rabbit, he only lasted a few weeks before a seizure took him. So when we saw Bouffe descend into the same misery, we automatically assumed the worst. However, rabbits can acquire a headtilt in different ways, and this makes their prognosis different too. While Bink succumbed to the neurological ravages caused by the e.Cuniculi parasite, Bouffe’s headtilt was caused by something else: an ear infection. There are examples of rabbits recovering from headtilt caused by e.Cuniculi, while others live on with their tilt when the progress of the parasite can be halted. It also depends on what kind of neurological damage is done by the parasite, and this is not necessarily the same in all rabbits with an ‘e.Cuniculi headtilt’. It is also worth pointing out that most rabbits are likely to test positive for e.Cuniculi, some figures suggest up to 60%, and thankfully the vast majority of those will never fall ill. Headtilt is one of the things that e.Cuniculi can cause, and we learned that headtilts can have a cause other than e.Cuniculi. 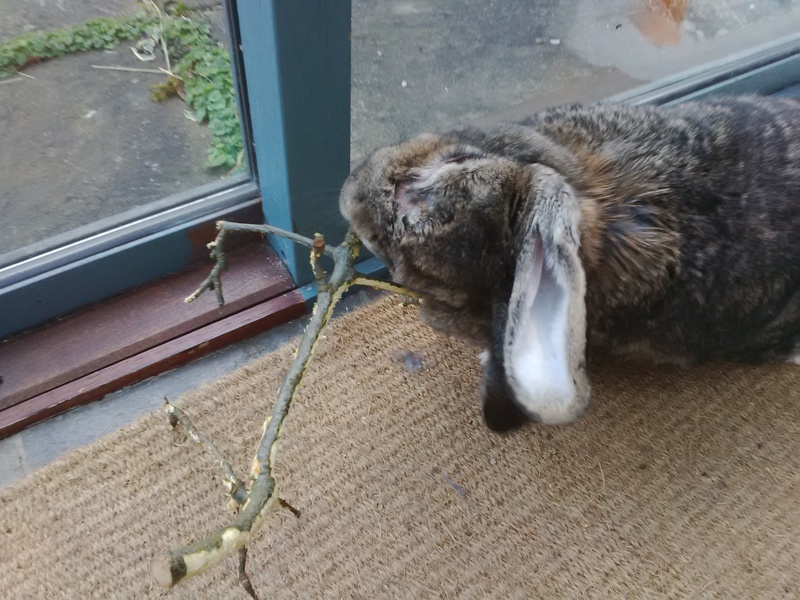 We thought we knew how resilient rabbits can be, and then we met Bouffe. Even in the hours and days right after the onset of his tilt Bouffe’s appetite was undiminished. He became a Roman senator and reclined while being fed his tasty morsels. As soon as he started to feel safe, he seemed less worried and started to calm down. After a week or so of sleeping, eating and being cuddled he also had more energy to start doing things. First, he started moving about more, so we gave him more safe, soft space. Then he developed an impressive ninja-flip to get up in a hurry whenever food or other excitement announced itself. He also learned to produce his cecals (wet poos that look like a bunch of small, shiny grapes) and turn around to eat them. Normally rabbits eat them straight from their dispenser, shall we say, but Bouffe cannot do this anymore. The cecals are important for rabbit digestion as they contain enzymes their gut needs to break down cellulose in their food. Rabbits do not produce this enzyme themselves, so they need to recycle them to keep a healthy balance. Bouffe also learned to map his surroundings so he can safely navigate his way around his home. He likes to follow walls, flower beds and other landmarks clockwise, we think it is to do with his altered field of vision. He can pick up quite a speed when moving around familiar terrain and is agile enough to jump up and down steps and obstacles that are several inches tall. Bouffe cannot get up to as much mischief as before, such as jumping on furniture or chewing on things. His balance and aim are not good enough for the former and the angle of his head is wrong for the latter! The upside of this is that he has no cage and is 100% freerange now. It is easy to look after him well. He gets weekly penicillin injections which we administer ourselves. These keep the infection under control, which seems to still be in his system somehow. He has been on these for nearly two years now and he does well on them. He also gets drops for his eyes, which need a daily clean. He cannot wash his face as well as before, so we lend him some help in the grooming department. His eyes don’t drain very well and can produce a mucky fluid when irritated, which they can easily become. The fluid tends to clump up his face-fur. Apart from some brushing when he is moulting, we don’t do any other grooming and Monsier Bouffe always looks meticulously clean from his ears to his tail. Bouffe has such a sunny disposition that we think he probably doesn’t mind when we just have to laugh at some of his antics and accidents. His new strategies for eating, grooming and moving about are just adorable to observe. Sometimes he falls over when he is washing a hard-to-reach spot on his back. It’s funny, so what? We laugh, and he responds to the commotion by coming up to the nearest set of feet or hands and nudge until a treat is forthcoming. He does love a fuss, does Bouffe. Yep, we get guilt-tripped into treats post-giggles, even if dearest Bouffe has no idea he’s doing it. Now that is clever, yes? How can we tell? Well, when Bouffe first came he was a seriously underweight bun who in the preceding six weeks had nearly died from starvation prior to his rescue, endured the Brazillian of Shame (also known as neutering) and just as he was getting used to his calm and pleasant surroundings at the Blue Cross, we put him in a car and drove him to yet more unknown surroundings, noises, smells and people. You bet Bouffe was majorly displeased and showed it. Because he had always had to worry about food he was very stressed at feeding time and would growl, lunge and scratch at hands. He did not like to be touched anywhere beyond his forehead and he did not want to approach us. These days Bouffe is the opposite of what I described above: he’s affectionate and will spend hours licking your hand if you let him. He gets up to greet you in the morning and does his little excited dance that includes waggling his ears and his tail and running up and down his favourite rug. A rabbit which is interested in food and eats well, is interested in contact and cuddles, and is lively, for example moving about, exploring or just following your movements with its ears is a bunny that’s happy to be around. Bouffe certainly is – and we’re enjoying being with him every day. It makes us very happy to learn that other ‘waiters and waitresses’ are picking up useful nuggets from Bouffe’s story. Perhaps a few other bunnies get more or better care as a result: great! And maybe the story gives those waiters and waitresses some hope and confidence they can do this too for their own bunny. Keep posting your questions or comments. We love to hear them and help other buns. Bouffe is adorable. I love to hear about him. Thanks for a very interesting, informative Bunnington Post.